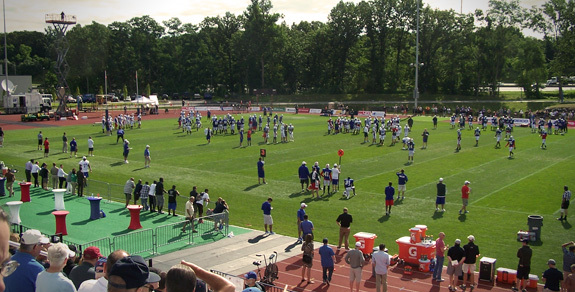 For a decade now, in what is certainly an annual tradition for the Campbell family, we welcome each new Buffalo Bills season by attending the first (and several more) training camp practices. The allure of this event is not just football. 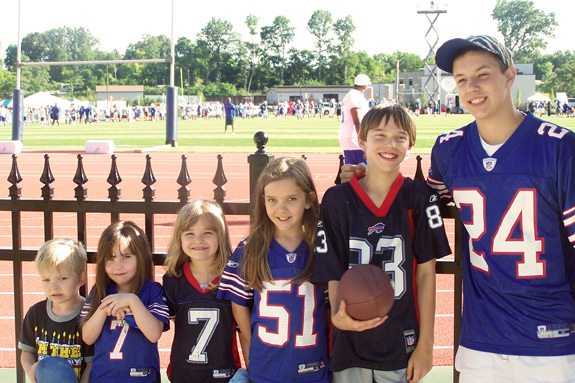 Sure, that’s the main draw, and we Campbells are always excited about Buffalo Bills football. (It’s true. We may have a problem…) But beyond watching the players practice in groups and as a team, sometimes only a few feet away from you, there are activities galore! There are several other vendors at the Training Camp, also, and most of them have some sort of giveaways. One of our first stops every year is the “Plinko”-style game at the Verizon booth. Some of their prizes include mini-footballs (handy for autographs! ), stickers resembling “eye blacks”, and this year, bead necklaces in the Bills’ team colors. Speaking of autographs, certainly one highlight for the older boys is flagging down players and coaches to sign anything and everything they can think of. 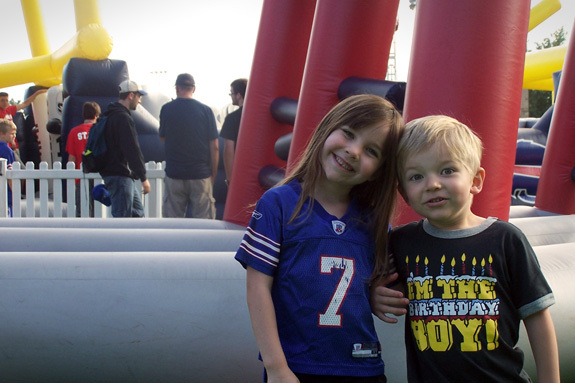 The players will often come over to the fences where the eager fans are lined up with their Sharpees and jerseys, footballs, programs, and every other sign-able thing. Bills Rookie QB, E.J. Manuel signs Cam’s blue football—with a personalized birthday message! 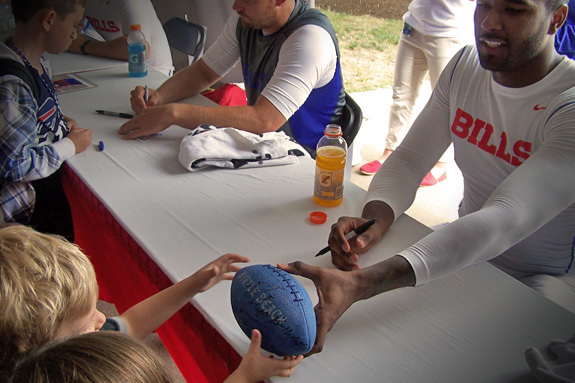 The Bills also have a tent set up where three or four lines are formed for scheduled autograph sessions for specific players. 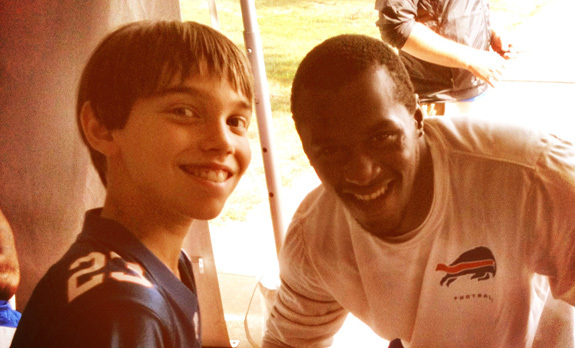 This year the Campbell kids got photos and autographs of the QBs and some of the DBs in the Autograph Tent. It’s not just limited to players, though. This year the boys even managed to flag down Peter King of Sports Illustrated (and a few other publications/media outlets) and get him to sign an item or two. Bills reporter, Chris Brown, and a few other lesser-known media members have also penned their names to one or more of the Campbell brothers’ possessions! 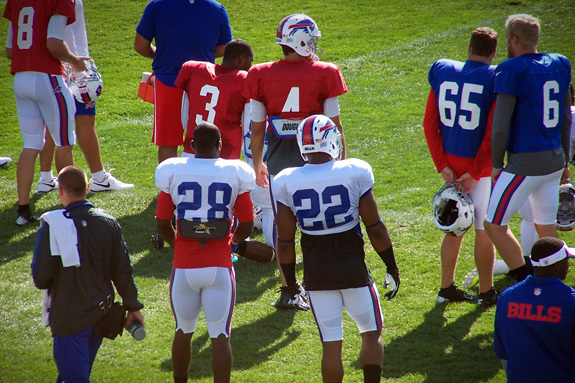 What will 2013 hold for this Buffalo Bills team? Not sure. There’s been so much change here. (Did you read my post from early July about this year’s Bills team?) It really does seem promising. At least it will be different. In the end, it’s just fun. Like training camp. Fun! But we still find the fun.